Ahhh...Spring Time. A time for renewal. A time for new beginnings. A time for downright misery. Blossoms. Allergies. Warm Weather. Severe Wind. Sunshine. Frost. It's just a season of opposites. I get just giddy with spring and when things start to bloom and my plants start creeping through the brown ground. This is the high desert people. Any kind of green, minus tumble weed, gets a person to smile. My green expectations have been set low since we moved here and I am even ecstatic when I see crab grass poking through the dry ground. Okay, some of you are going to find this post downright laughable. I'm assuming you'll be the ones who live in an area where green just happens all on its own. Call me envious. Here you have to work for the green. I'm still working through trial and error to find out what grows here. I'm slowly figuring it out. Plus, I want what takes the least amount of water. It's dry here. So I'll give you a little tour of what has started popping up. My irises are coming up like crazy. As is my catmint and feather grass. But those always come up. I'm going to show you the brand new items. We planted an apricot tree over 2 years ago. It's never bloomed. This year it did....a ton. 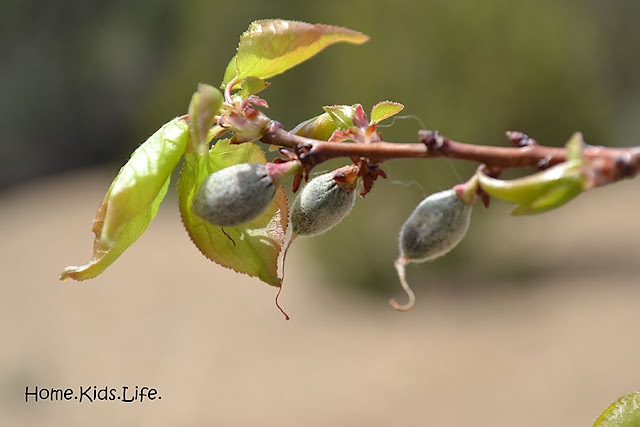 We even got baby apricots for the first time. Picture us all jumping in the air. Really, we did. And we told the kids we could have a party if we got apricots. Look at those pretty little baby apricots. Aren't they cute? Now picture us with sad faces. No party. We knew it was going to happen, but I try to remain optimistic. It freezes here well into and past the middle of May. We tried our best to cover the tree with blankets at night, but well...sometimes we didn't. The apricots are now shriveled little raisin looking dead fruits. Bummer. 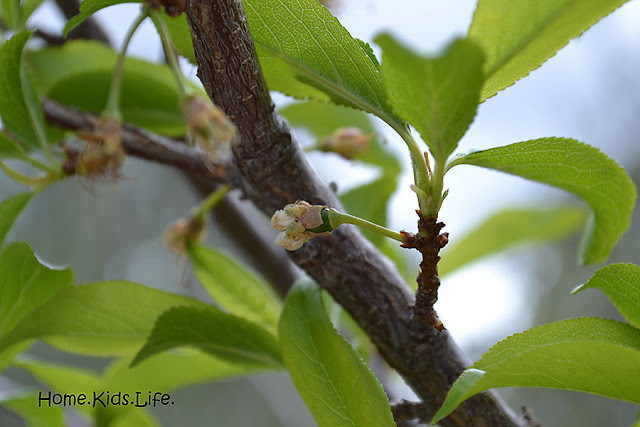 We knew it was too good to be true when the tree flowered way too early. On to the next fruit tree. We planted this one for Chewy's 1st birthday. She's now 5. It's flowered before, but we've never actually had any evidence of fruit on it. This year....FRUIT!! Can you see that tiny little green thing? And since this tree is a little behind the apricot, they are actually still alive. But I don't hold out much hope. We still have a month to go before it stops getting down to freezing temperatures at night. 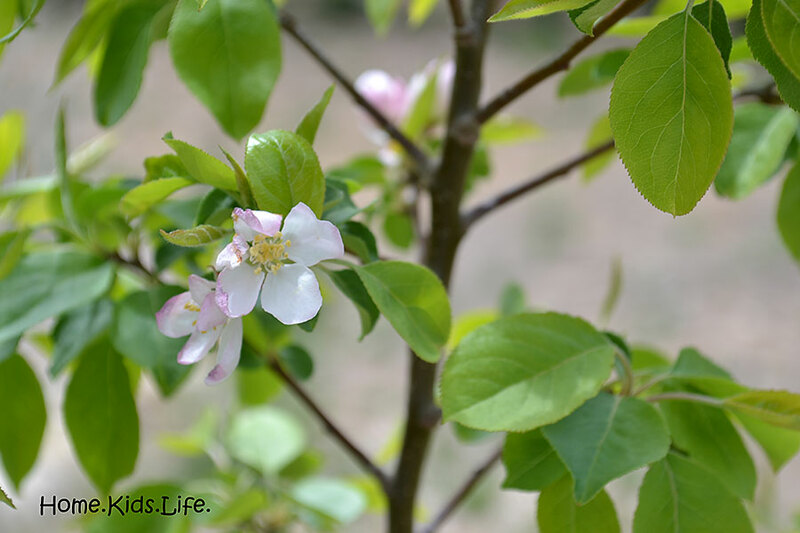 We planted a crabapple tree from one of those tiny bareroot seedlings in the spring of 2008. It was about 6 inches tall. Now it's taller than me (over 5 feet) and it bloomed for the first time ever. It's only about 9 flowers, but that gets this girl grinning from ear to ear. Success in the desert! Last fall I planted two rounds of grass plugs....that I grew on my own. You can find out more about that challenge here. All through the winter the grass plugs stayed green. Biker Boy and I were amazed. And they are still green and growing like crazy now. It's amazing. This picture is off our fenced in area. You can tell which grass the dog prefers to do his business on. It's lush. Okay, okay...to some of you this probably looks pretty sad. But this is amazing for us. In about 5 years I might have a whole area of green. I guess next to brown, green looks pretty good. You've just got to get down and it actually....kinda...maybe....if you use enough imagination....looks like a lawn. In the desert!!! Just pat my back and tell me I'm doing a good job while you turn the other way and laugh. Now if we could just kill the random bermuda grass since we're all allergic to it. Okay, moving on. Here's a view of the blue grama grass we put in as grass plugs a couple of years ago. You can find out about that adventure in this post. It's still alive! But it's growing very slowly, so it hasn't filled in yet. 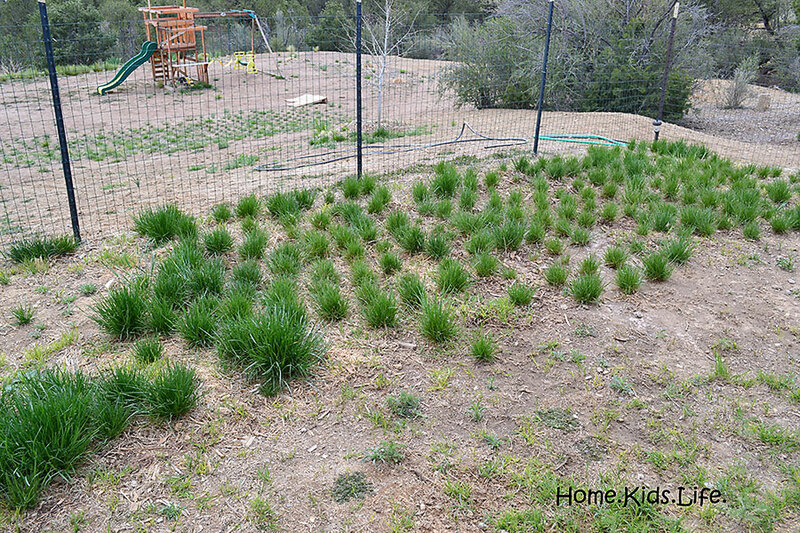 My plan is to start growing more grass plugs soon and get quite a few sets of them in this year. I'm going to start with our fenced in area. Then I'll move to our side yard. Then a few years down the road I hope to be up to the blue grama. 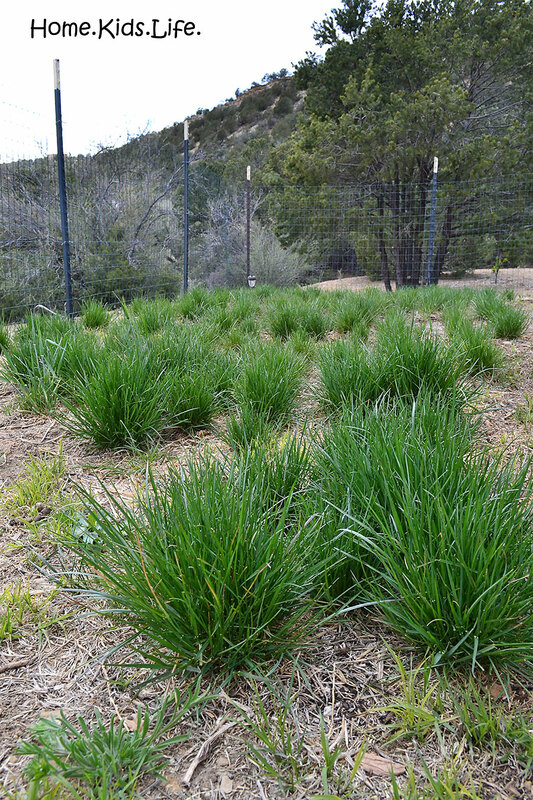 Oh....I'm using the Western Trails Native grass seed mix from High Country Gardens. I'm pretty happy with it. It stayed green through the winter and it's still alive! And I have to leave you with at least one green picture. 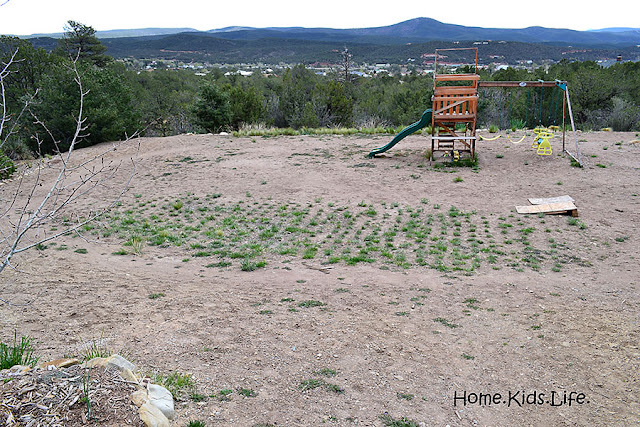 This is in our side yard where the grass has gone crazy (it was the low water/low work grass seed from High Country). Totally laughable, huh? 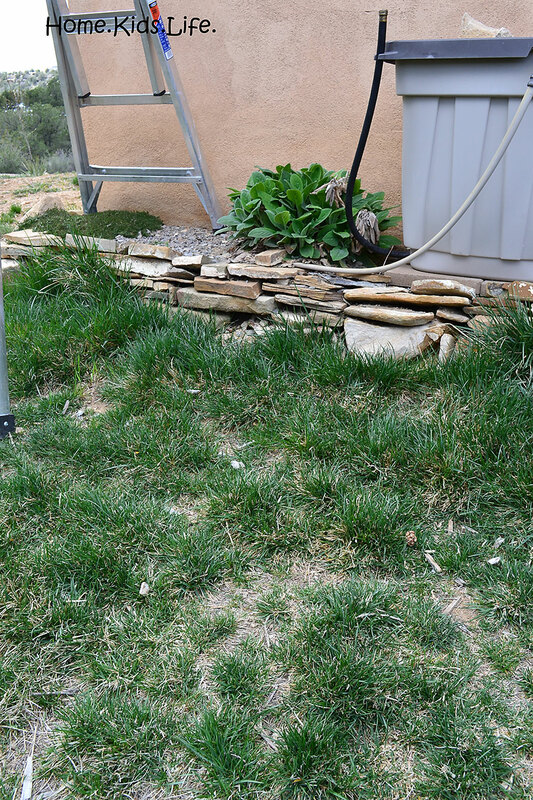 The grass gets the runoff from the water barrels, so it grows. Plus I love the green from my lambs ear plants and the creeping Veronica. I built that rock wall myself with rocks from our yard. Just thought I'd put that out there. And the ladder? We're finishing the painting of the trim that we started last fall. Almost done. What are your challenges with growing the green stuff? Any tips? Hopefully I've made those of you with green stuff (even weeds and crab grass) appreciate it a little more? Yep, I'm appreciating every bit of green I have. Except for tumble weeds.